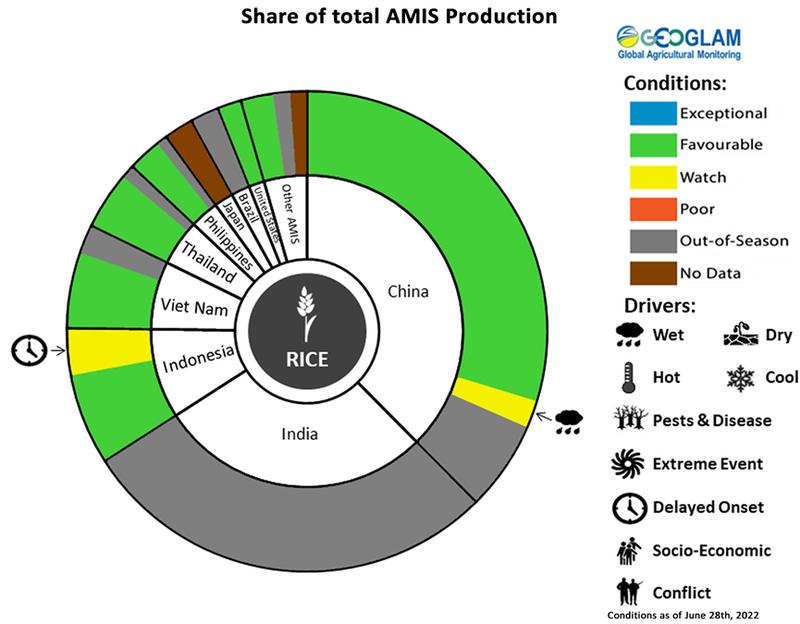 For more information on the AMIS Crop Monitor, please visit the website of GEOGLAM. Each slice represents a country's share of total AMIS production (5-year average). Main producing countries (representing 95 percent of production) are shown individually, with the remaining 5 percent grouped into the “Other AMIS Countries” category. The proportion within each national slice is colored according to the crop conditions within a specific growing area; grey indicates that the respective area is out of season. Sections within each slide are weighted by the sub-national production statistics (5-year average) of the respective country. The section within each national slice also accounts for multiple cropping seasons (i.e. spring and winter wheat). When conditions are other than "favorable", icons are added that provide information on the key climatic drivers affecting conditions. For more information, please visit GEOGLAM. In China, early-crop rice conditions are favourable with plentiful rainfall for irrigation. In India, transplanting of the Rabi rice is complete and under favourable conditions. In Indonesia, conditions are favourable as sowing of wet-season rice enters into the final month. Harvest of the earlier sown fields continues with yields expected to be close to average owing to sufficient sunlight during the growing season. In Viet Nam, conditions are favourable for winter-spring rice (dry- season rice) with sowing complete in the south and continuing in the north. Total sown area is noticeably higher in the north compared to last year due to warm weather. In Thailand, dry-season rice is being harvested under general favourable conditions with the exception of dry conditions in the northeastern region, which will potentially reduce final yields. In the Philippines, dry- season rice is in the maturing to harvesting stages under mixed conditions. Dry conditions in the southern areas during the critical growth stage may affect final yields. In Brazil, harvesting is ongoing with a noticeable decrease expected in production compared to last year due to a reduction in sown area. In the US, sowing is beginning in the south under favourable conditions.